There is a good reason why we dubbed this series the Huntmaster Pro. The Huntmaster Pro Series is one of the most feature-rich riflescope lines that Barska offers, featuring an Illuminated Red 30/30 Reticle, variable zoom, fast-focus eyeball, and parallax free at 100 yards. Huntmaster Pro rifle scopes have large objective lenses for maximum light transmission, and multi-coated lenses increases viewing quality in low lighting conditions. A solid 1 inch monotube contraction ensures that your Huntmaster Pro rifle scope will retain its zero after repeated recoil. 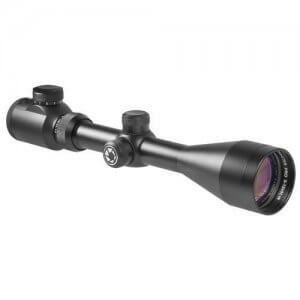 Each rifle scope in this series is fully shockproof, waterproof, and fog proof for maximum endurance and protection. 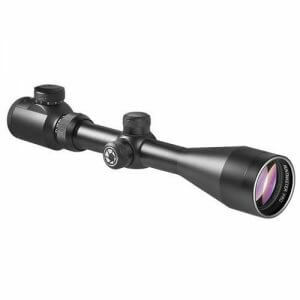 The Huntmaster Pro Rifle Scope Series includes lens covers and are backed by Barska's Limited Lifetime Warranty. The Barska Huntmaster Pro rifle scope series features an illuminated 30/30 reticle that allows for easier targeting in low light environments. An adjustable rheostat located on the ocular lens of the scope serves as the on/off switch for the illuminated retical, and can also be used to adjust the brightness of the illumination. This allows the user to adapt the reticle to the current lighting situation for a clear view any time of day.